From the Parc du Chateau in Nice in the Provence, France you can watch the many flights that arrive and depart from the Nice Airport. 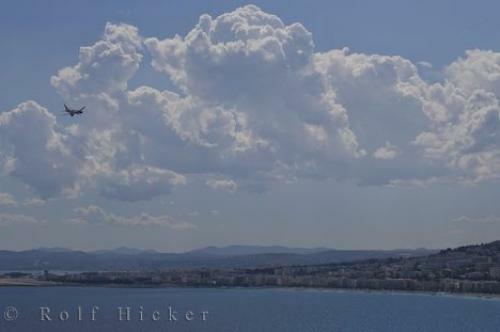 Photo of an airplane over Nice in Provence, France which is one of the many scheduled flights that land at this airport. ... you to your destination of choice or you can rent a car, follow the train directions or embark upon a helicopter as alternate ways to get where you are going. After one of the long flights, nobody wants to deal with transportation issues, so the Nice Airport tries to make things simple so everybody's vacation is hassle free.Plane coming in to land at Nice Airport seen from Parc du Chateau, Riviera, Provence, Cote d'Azur, France, Europe. I photographed this photo with the digital SLR camera model Canon EOS-1Ds Mark II, aperture of f/10.0, exposure time of 1/500 sec. on ISO 100, as always I used a original Canon Lens, the focus lenght for this picture was 100mm.